London was already calling Camrin Costello when Teya and I met her one summer night at Casper Fry. The bar wasn't terribly busy, and as usual, the subject of the work-in-progress book came up. Camrin, intrigued by the book idea, told the story of a cocktail she invented on a trip to England. 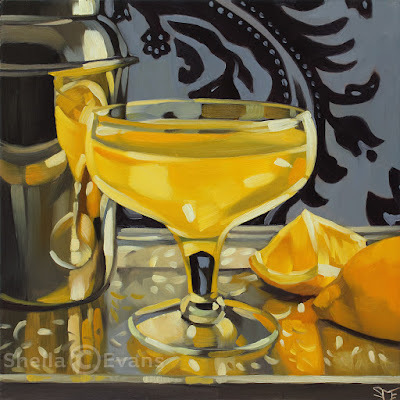 For the painting, I wanted to capture the contrast of the citrusy drink with a cool cloudy background that suggested the tradition of an old english pub. I changed the color of the purple flocked wallpaper to a stormy gray, and was quite happy with the result—especially the way the oversized pattern leads into the composition.